"I'm not going to fire you. Because I'm going to kill you!" 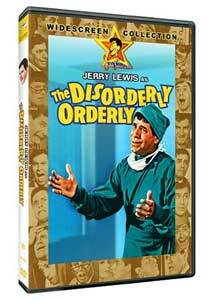 This fairly late Jerry Lewis solo effort is more of the same, with Lewis' whiny man-child wreaking havoc wherever he goes. But there's also an attempt at both social comment and a Chaplinesque sympathy that makes it unusual though not quite successful as a total picture. The injection of disturbing thematic material doesn't help matters. Jerome Littlefield (Lewis) is stuck as an orderly at the Whitestone Sanitarium, having been forced out of medical school due to his "neurotic identification empathy," which resulted in his taking on the symptoms of his patients. That's not Jerome's only psychological problem, however, for though he loves meek nurse Julie Blain (Karen Sharpe), he has carried a torch for blonde Susan Andrews (Susan Oliver) since high school. When Susan is committed to Whitestone for attempting suicide, Jerome's obsession comes to the forefront. After president Mr. Tuffington (Everett Sloane) declares "no money, no bed," Susan is in danger of being thrown out. But Jerome comes to the rescue by working double shifts and thus causing over twice as much chaos as he tries to fund the unappreciative Susan's stay. Lewis' character is a weird amalgam of his mugging character and a romantic lead that tries to make Lewis something he really isn't suited to. The combination leads to bizarre results, such as turning his previously sympathetic character into a creepy stalker who watches Susan sleep in secret. The inevitable turns of the storyline can only encourage creepy stalkers in the audience to force their attentions on their victims, which is hardly a socially useful accomplishment. There's not much credible romantic interest between Lewis and either Susan or Julie; it's difficult to understand what Julie sees in his character and Susan's predictable turnaround of feelings seems too abrupt to be reasonable. On the positive side, however, there are some good gags that border on the surreal, such as the snow on a television translating into snow in the patient room, a body cast that smashes to reveal no one at all inside it, and a vacuum cleaner plugged into Lewis' pocket. The proceedings culminate in an extended ambulance chase sequence that (other than some poorly-done process shots) is truly berserk and over the top. Despite the fact that the climactic chase seems obligatory, it's frequently fun and surprising, with a fair amount of excellent stunt work. What's really surprising about this film are the serious moments. Susan's self-pitying and suicidal fixations are treated with serious respect (dragging the comedy elements to a dead halt), and some sharp barbs are thrown at profit-oriented hospitals (and incidentally the funeral industry). The hospital management is portrayed as inhuman dollar-grubbers who care nothing for humanity but only getting the most profitable illnesses checked into the facility. None of it hangs together terribly well with the usual Lewis schtick, making for an uneven whole. Image Transfer Review: The anamorphic widescreen picture generally looks decent, with vivid color and deep blacks. Although skin tones sometimes look off, closer inspection reveals that the main problem is that Lewis seems to have an unnatural tan; everyone else looks fine, so I'm considering this not to be a transfer problem. The picture is moderately grainy and sometimes a bit soft, but thankfully Paramount has declined to add artificial edge enhancement to make it something it's not. The result is filmlike if not sparkling. Detail and texture are both acceptable. Audio Transfer Review: French and English 2.0 mono tracks are supplied. Both have moderate hiss but it's not excessive considering the film is 40 years old. The music sounds fine, although the theme song, sung by Sammy Davis, Jr., sounds a little murky. Dialogue is clear and crisp throughout. Extras Review: In addition to an anamorphic widescreen trailer, the principal extra is a set of outtakes totalling 5m:54s, mysteriously described on the case only as "archival materials." Four different segments (some with multiple takes) are provided, with a Play All feature. The outtakes are in black and white, full frame, for some reason. Most of them involve Lewis clowning around on the set and disrupting the takes, but they're pretty entertaining as a whole, demonstrating his skill at ad libbing. The chaptering on the feature is a little thin but acceptable. A somewhat uneven Lewis vehicle with moments of pretension to societal comment, with an okay transfer and some amusing outtakes that are often funnier than anything in the finished film.